Benvenuto Disertori was taught at the Accademia in Venice by Guglielmo Ciardi. Thereafter he travelled widely. He was in Munich, Rome, Berlin, Florence and wandered over the provinces of central Italy. The small cities of Umbria and Tuscany: Fiesole, San Gimigniano, Gubbio, Perugia, awoke his love for poets and artists of the thirteenth and fourteenth centuries and here he found his vocations, devoting himself to engraving either in wood or in copper. 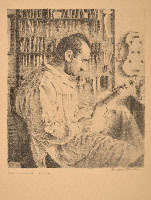 Disertori was also a musicologist and a collector of musical instruments.